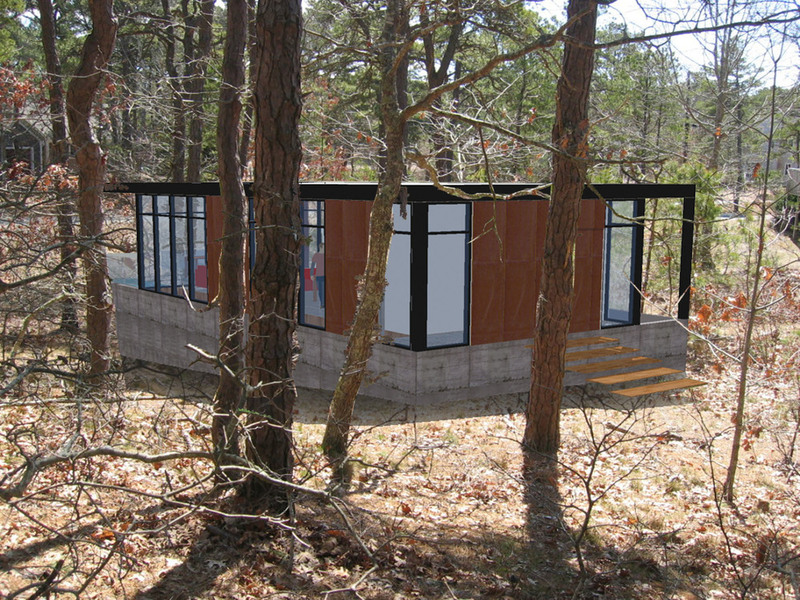 This home on Cape Cod was inspired by the mid-century modern heritage in the area (architects like Marcel Breuer and Walter Gropius did a lot of work here) as well as more subtle Cape Cod elements like the concrete seawalls and the rich black-brown pine tree bark. 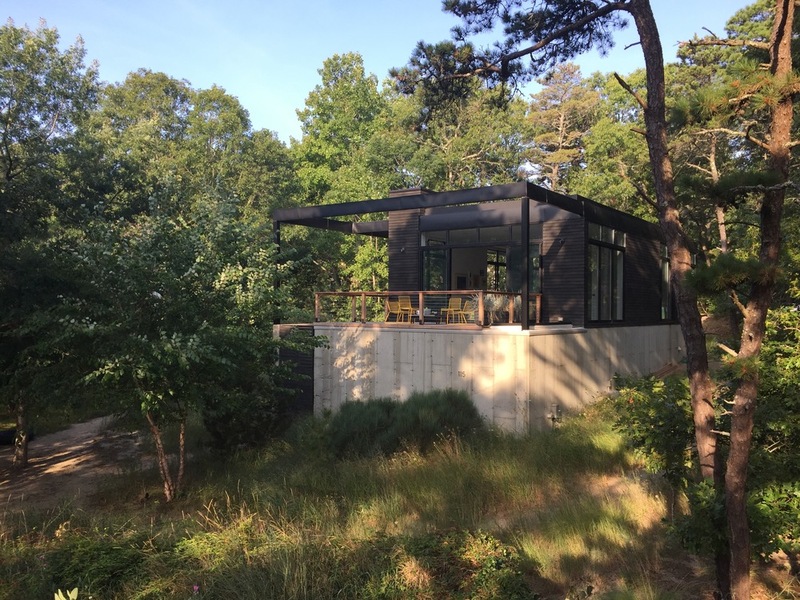 The mixture of glass and black-stained mahogany siding was intended to blend into the forest, and the inverted room arrangement with living space on the upper level raises you into the trees and provides a view of the tidal marsh nearby. 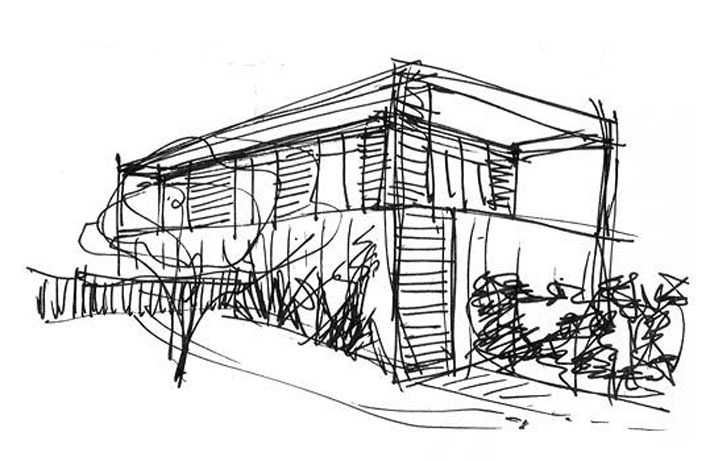 The intention with the overall design was to encourage relaxation and appreciation of the environment. The stairs help slow one down on the ascent and decent through the long, shallow steps. This almost forces you to not rush as you head upstairs in the morning or head downstairs to take a shower. Even the access to the stairs is around the kitchen and through the entry in the circular pattern which also forces one to take a more contemplative path past a number of lovely views out through the tree tops on your way. The main entrance is on the second level at the back of the house which also makes you travel a bit from the driveway through the lot and around the house so you're also forced to appreciate the natural surroundings. Finally the lower level rooms only have views into the courtyard. Since you can't see any traffic or other activity, the focus is on the sun and gentle sway of the bamboo in the courtyard so you're again reminded to slow down and appreciate the subtleties of the natural environment.